Join IPM at HIV R4P 2016! Join IPM in Chicago 17-21 Oct. for the 2nd HIV Research for Prevention (R4P) Conference to learn about the latest research advances and how they fit into the HIV prevention landscape. Find IPM and its partners at the sessions below, where you’ll get updates on the dapivirine ring and other products specifically designed to address women’s HIV prevention and broader sexual and reproductive health needs. Not attending R4P? Follow us on Twitter at @IPMicrobicides to keep up with news and quotes that catch our eye! Following the dapivirine ring results released earlier this year, this informal, interactive session will engage attendees in outlining concrete strategies and actions needed to advance the ring and women’s HIV prevention. IPM’s clinical trial partner MTN will present three abstracts on dapivirine ring adherence data from the ASPIRE study. IPM's monthly dapivirine ring has been shown to safely help reduce HIV risk in women. 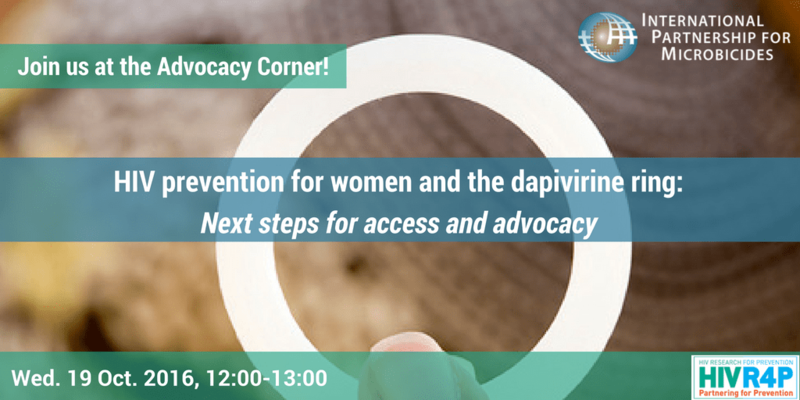 Come to the R4P Advocacy Corner on Wed. 19 Oct., 12:00-13:00, for an interactive session on the next steps for access and advocacy needed to advance the ring!